Newer bungalow style home with open floor plan featuring cathedral ceilings in the great room and Four Seasons Sunroom leading out to the upper deck. 2015 Updates -- new kitchen, hardwood floors, updated bathroom, fresh paint and bedding. The kitchen is compact but fully equiped and open to the great room. Two lower bedrooms, one with a double, the other with two twins. Upstairs is a large loft that has both a King and a Double. First floor laundry room. Upper and lower decks both have tables, upper table seats 4, lower table seats 6. The house sits close to the lake and has great views from inside. There is a firepit with 6 adirondak chairs and a hammock. You'll love the cozy feel, peaceful setting and close proximity to Torch Lake. Plenty of dockspace for your boat! Amenities: The home features cathedral ceilings, open great room with galley style kitchen and sunroom with floor to ceiling glass. Berber carpet throughout, ceramic tile bathroom. Wrap around deck has table and chairs. Backyard has two chaise lounges and sandbox for the kids. Grill is available for use. Activities: Golf at Shanty Creek, Anterim Dells, The Farm and more (20 min). Skiing at Schuss Mt and Shanty Creek (20 min). Within walking distance of U-Pick Orchard for Strawberries and Apples (2 miles). Driving distance to Peaches and Cherries (25 min). Quiet country setting offers miles of biking. Many antique shops in the area~ Elk Rapids, Alden, Bellaire, Central Lake. Great shopping in Charlevoix and Traverse City. Boat to the well known Dockside Restaurant located 10 min away by boat at the mouth of Torch Lake. Dine outside on the expansive deck overlooking Torch Lake. We currently live in Waterford, MI without two kids and two dogs. When our kids got super busy with sports we decided to share our home with others and it's been a great experience. Over the years we've been lucky to have people who have come back year after year. Several have fallen in love with the area and purchased places of their own. We may be biased, but we feel like we have the best spot on the lake! Our home sits across from a nature preserve and it's on the widest part of the lake so looking out from the house you really get that up north, quiet feeling, even though you're never more than a short boat ride to Torch Lake where all the action is. The house itself has large windows and door walls and an all glass sunroom with gorgeous views of the lake. There's a huge deck very close to the waters edge and the way the house is situated you're not looking at the neighbors. Great spot for biking, jogging, long walks. Close to Bellaire for shopping and restaurants. Visit Shorts Brewery and Lulus! We do have high speed internet. Stainless steel, ice maker, new in 2015. Electric ceramic cooktop, new in 2015. Kitchen table seats 4 but pulls out to seat 8. No leafs are needed. Large deck, close to lake and fire pit. 20 minutes from Shanty Creek Resort. Enjoy beautiful views of the Grass River Nature Preserve. Curl up with a blanket and a good book in the Solarium with 180 degree lake views. Ready for dinner? Less than 5 minutes in the car gets you to the famous 'Dockside on Torch lake' for great casual dining. Ask about our Water Adventure package! Waterskiing and wakeboard lessons, boat tours, kayaking, tubing, sight seeing, fishing. We will customize the day to fit your families water adventure style! We enjoyed staying here; while there were only the two of us, there is sleeping for 8. The kitchen/dining/living areas are open, which we really like; appliances look new & all work. A washer & dryer is in the home. There is a new dock which would have been handy had the weather cooperated. Shelly was great to work with. Would definitely recommend this property. Thanks Diann, You were great as well and I appreciated your understanding when we had the unusual issue with the condition of the house upon your arrival! Loved the house! Loved the area! House was perfect! Thank you Shelly! We had 3 great days and really enjoyed the area as well. The House was perfect for my wife and I and we really enjoyed the lake. Little rain, no problem! Very nice. Clean and cozy with nice views. Great spot for kayaking. Another great week on Clam Lake! Great location. Nice kitchen for cooking. Comfy beds. Dock for a boat and watching the lake wake up in the morning and the sunsets at night. Hope to come again next year! 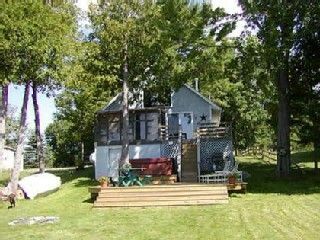 We’re so glad the the cottage worked out well for your vacation and we look forward to having you back again!! Thank you so much for choosing our place to stay. We loved our staying at your home!! It had every we needed and the views of the lake are simply stunning!!! It was a perfect location for everywhere we wanted to go! We will definitely return! Thank you so much!! Happy Anniversary! We’re so glad that you enjoyed your time at our cottage. We look forward to having you back! Northern Michigan waterfront at it's best. Peaceful, quiet location yet still close to shopping, golf and many other activities. Newer home with 2 story ceiling in great room, lake views from kitchen, sun room, great room and upstairs sleeping loft. Updated decor. Laundry room. Kitchen has all appliances, fully equipped. Just 5 minutes from spectacular Torch Lake, visit the famous Dockside Restaurant for casual dining. Turtle Creek Casino is 30 minutes drive. 40 minutes to Charlevoix and 40 minutes to Traverse City.